Does my quote include removal and transportation of debris and disposal fees? Yes, we haul your demolition debris to a certified disposal facility. All expenses and fees associated with transportation and disposal are included in the quote. What demolition services do you provide? We provide demolition services of all sizes. Our teams are trained and equipped to handle residential, commercial and industrial demolition, tank decommissioning, selective demolition and removal of small structures, pools and hot tubs. If you can build it, we can demolish it. Interior demolition is the non-structural demolition of spaces within a structure. Interior demolition is usually done in preparation for reuse and upgrading of the structures interior space. This may include interior wall and ceiling removal, demolition of flooring and some utility services, salvage, and selective structural demolition. Do you demolish small structures? Yes. We are equipped to handle demolition jobs of all sizes including sheds, small miscellaneous structures, concrete slabs and driveways. Yes, we demolish inground and above ground pools. We also demolish decks and remove hot tubs. What should I know about asbestos? Asbestos can be found in pipe and ceiling insulation, sprayed-on fireproofing, flooring, roofing materials and some cement products. Overexposure to asbestos can cause serious health problems. The safe removal of asbestos, asbestos abatement, is a major part of the demolition process. Safe handling and disposal is highly regulated. Simply call us with any changes. Please have your receipt and order number available for cancellation or changes to your order. All changes must take place one business day in advance to allow for processing. Cancelled orders may incur a cancellation fee; as terms and conditions apply. What if I need to keep my dumpster longer or have it removed sooner than anticipated? All changes to your order must occur at least one business day in advance to allow for processing, as terms and conditions apply. There is an additional charge for keeping the dumpster longer than originally elected in your order. Will it cause driveway damage? We highly recommends that the customer protect any surface where the roll-off is going to make contact with the driveway with a 4’ x 8’ sheet of plywood. Customer affirms that any right-of-way provided by customer (disclosed in delivery questions) for the roll-off dumpster is sufficient to bear the weight of all contractors’ equipment and vehicles required to perform the contracted service. The customer assumes all liabilities for damages to private driving surfaces, pavement or road surfaces and entire dumpster placement site. Our affiliates shall not be responsible for any damages to any private driving surface, pavement or accompanying subsurface of any route associated to perform the service that was contracted. Can I place the dumpster on the street? It depends on the rules and regulations of your local municipality. Permits may be required. Please check with them directly. How much space do I need for the dumpster for delivery? Please refer to the dumpster dimensions listed on this site for each dumpster type. 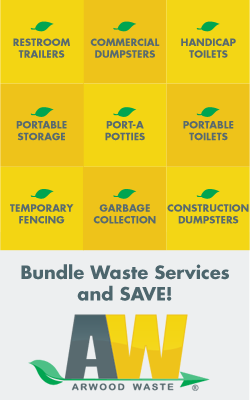 It is recommended that you provide space to accommodate double the amount of the width and height of the dumpster to assure adequate height and space clearance. Also consider an additional 10’ for the door that swings open at the back of the dumpster. 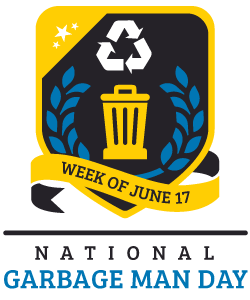 What are the unacceptable materials items for roll-off dumpsters? Hazardous waste, dirt, industrial waste, chemical products, oil filters, herbicides & pesticides, radioactive material, solvents, paint (except completely dried latex paint cans, no liquids), other flammable liquids, aerosol cans, propane tanks, motor oil, transmission oil/lubricating/hydraulic oil/oil filters, contaminated oil (mixed with solvents, gasoline, etc. ), antifreeze, appliances, petroleum-contaminated soil/lead paint chips, tires, batteries, computers, monitors, televisions, microwaves, fluorescent tubes, railroad ties, medical waste, asbestos, animals, barrels, all liquids. Material must be level at the top of the dumpster; nothing can be sticking out of the top. Additional requirements may apply based upon locality. The liability for appropriate waste remains with the customer as agreed to in the terms and conditions when contracting with us. When ordering online, you will see dates available for delivery on the calendar. All online orders must happen at least one business day in advance to allow for processing, as terms and conditions apply. Please note there is no guaranteed delivery time, so if a dumpster is needed first thing in the morning, schedule delivery for the day prior to ensure it is in place ahead of schedule. Yes! You can order online anytime, however, all online orders must occur at least one business day in advance to allow for processing, as terms and conditions apply. You can have additional hauls with your order. Please note you will be charged the full initial quoted amount for each additional service to the dumpster. However, your order confirmation email may contain a promotional code for discounts on additional service. What if the driver comes for delivery/removal and I am not ready for the dumpster to be delivered or removed? An extra trip charge will create an additional charge from the initial quote. You will be charged for any additional trips, per the terms and conditions. Is it necessary for someone to be there when they deliver or remove my dumpster? It is not necessary to have someone onsite for delivery or removal of the dumpster. However, please be as detailed as possible when answering the delivery questions, as the driver will use their judgment and place the dumpster in the safest accessible area. If an onsite contact is not available for delivery, you will be responsible for all charges involved with relocation of the dumpster should it be necessary. For removal; customer agrees to provide unobstructed access to the dumpster on the scheduled pick-up day; if dumpster is inaccessible, customer is subject to additional pick-up charges, as terms and conditions apply. Yes, if your tonnage goes over the included tons quoted in your order you will be charged additional costs, as terms and conditions apply. Can I rent a toilet for one day only? Yes! Our Luxury Portable Toilets are perfect for weekend events, or even a one day party. Please order at least 2 days prior to your event whenever possible to ensure availability and delivery convenient to your schedule. Will the toilets be hygienic for my event? Absolutely! Luxury Portable Toilets are reserved only for special events and parties, and are not used at construction sites. How far in advance do I need to order my toilet(s) and/or trailer(s)? To ensure our Preferred Vendors can provide you with exactly what you need, we request that you contact them at least 2 days in advance of your event. For large events or highly populated job sites, a week or more lead time is encouraged. However, if you require same day delivery, most Preferred Vendors can accommodate you. Where does the waste go after the restroom has been serviced? The waste is transported to a local waste water facility and disposed of according to the regulations and procedures required by the local governing laws. How do you keep the waste from freezing in colder climates? Anti-freeze is typically mixed in with the deodorizing water that is placed in the tank. It works to keep the water liquid and unfrozen in colder climates. All products used are acceptable to local waste water facilities. Am I required to have a portable restroom on my construction site? Most city ordinances specifically detail the requirements regarding portable sanitation on construction sites. Generally, inspectors require that a portable toilet is ordered and on site before approving the inspection. Additionally, OSHA requires a portable toilet on a construction site, as listed under the Safety and Health Regulations for a Construction Site (1923.51 (c) (1), 1926.51 (c) (3), (I), (ii), (iii), (iv)). For information regarding specific city or country ordinances contact your local Preferred Vendor. How often will my portable restroom be serviced? The standard service is once a week so that the units are fully stocked with supplies, cleaned and sanitized. The standard fee includes once a week service. We can provide service more frequently if required. What happens if my portable toilet gets knocked over? Contact your local Preferred Vendor as soon as possible to report the incident. They will then dispatch a driver to come to the site and make the necessary adjustments. Does a portable restroom on my construction job site really cut down on expenses and time? You can reduce employee downtime by providing a convenient alternative to your employees spending invaluable time searching for a restroom because no restroom has been provided. Formula: Hourly Rate divided by 60 Minutes Per Hour x 10 Minutes x Number of Employees x 255 Days Per Year. For more information regarding this study, please contact the Portable Sanitation Association International at 1-800-822-3020. What are the rules for the ADA restrooms? Our Preferred Vendors offer portable wheelchair restrooms that are ADA compliant for use on your construction site or special event. ADA units are large enough and obtain the proper elements to meet the standards that have been outlined by the Americans with Disabilities Act. Specifically, the statute states that for single user portable toilets clustered at a single location, at least 5% but no less than one toilet unit shall be installed at each cluster whenever typical inaccessible units are provided. Accessible units shall also be identified by the International Symbol of Accessibility. The exception is that if portable toilet units are used exclusively by construction personnel who to not require the use of an ADA unit, you are not required to comply with this statute. (Federal Register/Vol. 56, No. 144/July 26, 1991/ Rules and Regulations/ 4.1.2 Accessible Site and Exterior Facilities: New Construction). For a complete set of ADA guidelines relating to portable restrooms, please contact your local Preferred Vendor. Where can my portable restroom be placed? Our Preferred Vendor will place your units at your event or job site per your instruction. They will make every reasonable attempt to accommodate your desire for specific placement on the unit. However, we will relocate the unit and notify you if it becomes necessary, so that we may service the unit safely. How do you cut down on the odors and germs within the unit? Our Preferred Vendors have highly trained employees that will not only pump out the holding tank, but will clean the inner bowl of the unit and provide thorough janitorial service inside and out of the unit. They clean and sanitize the portable restrooms at each service, as well as provide a special sanitizing detergent in the water that also acts as a deodorizer to keep the unit smelling pleasant while reducing your exposure to germs.